Some Chit Chat, And Some Chai: This Borivali Joint Is Where You Can Weave Conversations! Chitchat Chai in Borivali is a tiny outlet that serves a variety of pocket-friendly teas, food and non-alcoholic beers to choose from. And if you want to catch up with your friends old and new, here's where you need to be. Tucked away in one of Borivali's busy lanes, is this rather tiny but bright outlet Chitchat Chai. Like us, if you are a coffee lover, your first question too would be- we will get coffee, right? But worry not, they have quite a few options for coffee and a large variety for tea. They're known for their kawa, ginger and elaichi tea varieties. We even enjoyed their shakes and coolers; a nice variety to pick from. The food, with limited options to choose from was still delicious and pocket-friendly. Our pick of the day however, were the Coffee Shots. 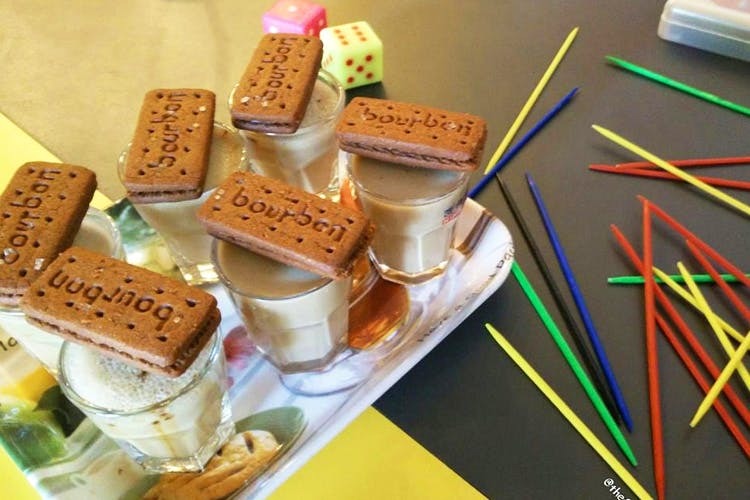 Choose between hot or cold coffee that is served in cutting chai glasses with Bourbon biscuits. Nostalgia's got to be a little comforting and sweet, isn't it?! What's best is that they even deliver to nearby areas, so if you're lazy, just hit them up for your dose of coffee shots while Karan Johar has his. Coffee and Bourbon biscuits is definitely a kickass combo, you don't want to miss out on it!